And the winner of the shawl giveaway is…. There were 10 donors. Two of these fabulous folk said in their comments that they just wanted to donate and preferred to let someone else win the shawl. So there were eight entrants total. I gave each entrant a number, 1-8. 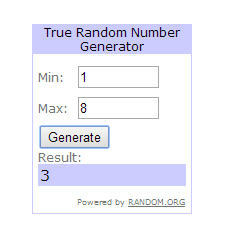 Then I drew a number using a random number generator. The winner was #3 – Kmkat from Kmkat and Her Kneedles blog. Thank you for doing this! I am on the board of our local humane society in Polk County WI, and I support any and all such endeavors. I just bought two bags of pet supplies at the local supermarket, which does this thing annually where they bag up pet supplies in $5 and $10 bags. Customers *buy* them, leave them in a special spot in the store, and the store delivers them to the county humane society. (This is a great store. I have sold raffle tickets there for the humane society. It sounds like Kmkat is a staunch supporter of her local humane society. On the board and everything. Congratulations Kmkat! 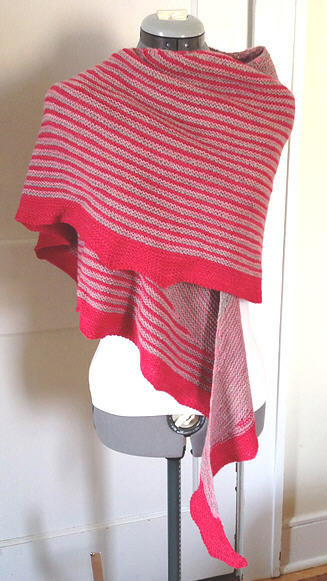 I’ll be sending you an email to confirm and to get an address so I can ship you your shawl.